Located in the heart of the Downtown Norfolk Historic District, the Pender Building is an excellent example of Victorian style architecture. Built in the early 1900's, the Pender includes eight upscale residences that sit atop two commercial units on the ground floor. 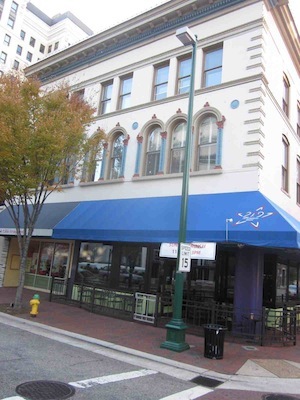 The Pender has long been home to one of Granby Street's favorite restaurants "219, An American Bistro" and also houses "Edible Arrangements." Association and property management is provided by Hutcheson Realty, Inc., at 5629 Providence Road, Virginia Beach, VA 23464, phone: 757-424-2222. The neighborhood surrounding the Pender provides all the amenities of modern urban living. The Granby Street area features a broad spectrum of restaurants and entertainment venues such as the NorVa and the Granby Theater. The Chrysler Museum, Harrison Opera House, Chrysler Hall, MacArthur Memorial, Slover Library, Nauticus and d'Art Center are all within easy walking distance as well as the Wells Theater, home of the Virginia Stage Company. Scope Arena, home of the Admirals ECHL Hockey team, and Harbor Park, home of the Tides AAA baseball team are close by as well. Shopping at MacArthur Mall is literally one block away with a full range of retail and the Regal MacArthur Center theaters. The MacArthur Station on the new Tide light rail line is also within a block providing easy access to the medical facilities at Sentara Norfolk General, Eastern Virginia Medical School and the Children's Hospital of the King's Daughters. The Tide coupled with the revised route 16 bus up Colley Avenue provides quick and easy access to shopping and dining in the Ghent District and on up to Old Dominion University. The new Town Point Park on the Elizabeth River waterfront hosts a full slate of festivals and entertainment, including the annual Harborfest celebration. Also on the waterfront, the Victory Rover and the American Rover host narrated tours of the Naval facilities, the Spirit of Nofolk offers dinner cruises, and the HRT paddlewheel ferry provides service every 30 minutes across the river to Portsmouth's downtown district including the nTelos Pavilion. The Pender Condominium is a member of the Downtown Norfolk Council and the Downtown Norfolk Civic League.